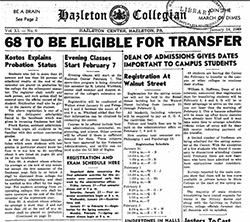 Hazleton Collegian flourished from December 1937 to December 1954. The publication was published monthly through 1941, then became a weekly edition. The title changed to Highacres Collegian in January 1955 and is the current name of the student newspaper. This digital collection is through April 1994. Due to the irregular publication frequency, there may be gaps in holdings digitized.